Buying Guides February 13, 2019 0 Milan A. Basement air purifiers are the best solution for the basement, because in the basement humidity is high, and mold is growing everywhere. There is not enough fresh air, and most of the basements don’t even have a window to let fresh air in the room. Because of that if you wish to have clean air and no mold in your basement, you need to use an air purifier. But not every air purifier will do the job at removing mold and keeping the place at a clean state. You need to look at air purifier that uses true HEPA filter that is capable of removing 99.97% of airborne particles. That kind of air purifier will remove mold spores from the air and in the process eliminate mold in your basement. Once you remove mold in your basement, you need to use a dehumidifier. Some basement air purifiers have this option and are an excellent choice for a cellar. A dehumidifier will make sure that your basement is not having a high level of humidity which helps mold grow. Mold loves damp, dark places with high humidity and if you remove moisture from your basement mold will be gone. 1 Why Should You Use Basement Air Purifier? 3 Are Air Purifiers Good for Basement? 5 What is the Best Air Purifier for Basement? Why Should You Use Basement Air Purifier? If you accidentally got on this article, you are probably thinking that a person who spends so much money on a basement air purifier is crazy. Who would invest such money for a basement that rarely gets visited? Not all basements are the same, some homes have clean basements and putting an air purifier in that type of basement can have huge beneficial factors for the whole house. For example, if you place a decent basement air purifier, you can prevent accumulation of mold and mold spores in an entire home. I understand that people who have filthy basements with no glass on the windows won’t spend a dime on their basement, but some homes have clean, productive basements where they store food and other things they regularly need in the house. Are Air Purifiers Good for Basement? Air purifiers in the basement are an excellent product to reduce mold and mold spores. Air purifiers are powerful to remove mold, and by that, it is better to fight with mold in the basement instead of in the bedroom. In the basement, you can have a long passive war with mold while in the bedroom you need to remove mold as soon as possible or your health problems can get worse by breathing mold spores while sleeping. In many old homes, the mold is already in the house, but the source of all that mold is coming from the basement. It is better to prevent mold from coming in the basement and in that way prevent it from entering the house. Mold loves damp places like basements, and if it starts to grow in such a lovely dark and damp place, then it is only a matter of time when it will enter the rest of the house. In this list of the best basement air purifiers I will try to help you choose the best air purifier for your basement and your needs. All 5 of the following products are ideal air purifier in the basement. Whatever air purifier you choose you can’t go wrong, but we need to understand that they are not the same and some of them are better than others. Alen Breathesmart is an expensive air purifier, but you will get what you have paid for. For the money you spend, you will get fantastic air purifier capable of removing mold from your basement without a single problem. It has a HEPA filter that will work in a cellar like a pro. Alen Breathesmart is for large rooms of 1100 square feet which means you can place it in a huge basement. Filters will not need to be replaced for up to 12 months, and there is a light that will tell you when your filter needs replacement. With all these incredible features Alen Breathesmart is not just the best air purifier for the basement but also one of the best air purifiers in the world. Alen gives you a lifetime warranty on their product. Yes, you read it right, they are so sure in their product that they offer a lifetime warranty and 60 days money back guarantees. If you have this kind of budget Alen Breathesmart is the best basement air purifier. By having Alen Breathesmart, you won’t need any other air purifier in the basement. Area Coverage The Alen BreatheSmart covers up to 1,100 square feet, which is perfect for living rooms, offices or larger, open-concept layouts. Whisper Quiet Performance You don’t have to choose between high performance and low noise. IQAir HealthPro Plus is an energy efficient air purifier that comes with patented HyperHEPA filtration system that has more power than a standard HEPA filter. This filter will make sure no mold spores are spread in your basement, and no mold will grow. This air purifier is strong and can filter even the smallest particles in the air. HyperHEPA filter will not need a replacement for almost a year, but this depends mostly on the pollution in your basement. But don’t worry about filter replacement because there is a LED light which will tell you when your air purifier needs replacement. HyperHEPA TPatented HyperHEPA® filtration up to 100X more effective than standard HEPA. Energy efficient Uses no more power than a conventional light bulb. Rabbit Air purifiers are recognized by their highly advanced filtration system called BioGS HEPA. Rabbit put a trademark on this technology and is proud of the filtration powers that this highly advanced filtration system provides. This air purifier looks amazing and is not meant to be inside a dark, filthy cellar, but if you have a clean cellar with expensive bottles of wine, then this advanced air purifier will be an ideal choice for you. Rabbit Air MinusA2 is perfect solution for large basements. MinusA2 have the power to filter large rooms up to 700 square feet and with a BioGS HEPA filter you can be sure that no mold spores will be left flying in the air. Ultra quiet The cutting edge BLDC Motor operates at five different speeds. It’s virtually silent at the lowest speed. Smart A light sensor will automatically transition the unit to sleep mode when the MinusA2 is in a dark room, and resumes a more active mode when light levels increase. Adaptable The MinusA2 is designed to either stand alone or to be mounted on the wall. Honeywell True HEPA Allergen Remover is made for medium basements of up to 470 square feet. It is a smaller air purifier but with lots of power. It uses true HEPA filter which guarantees mold spores removal. With activated carbon prefilter your basement will not have that bad basement smell. 99.97% of particles will be removed, and air in your basement will be again fresh. If you place dehumidifier along this air purifier, you will no longer have any mold problems in your basement. Honeywell is a well-known company that deals with air purifiers. This model is one of their best air purifiers that are capable of removing most of the allergens from the air. Easy to Maintain Replacement Filters The Pre-Filter A (model HRF-AP1) needs to be replaced every 3 months. The Certified HEPA filter (model HRF-R3) should be replaced once a year. A filter light reminds you when to change the filters and they are easy to replace – no tools required. GermGuardian AC4825 also has true HEPA filter so you should not worry about mold spores. But this little air purifier also uses UV-C technology in combination with titanium dioxide to kill airborne bacteria, viruses, mold spores, and germs. Because of this technology this little air purifier is an excellent choice for a basement. Not only it will remove mold spores with a true HEPA filter, but it will also use this advanced technology to kill mold spores. The GermGuardian air purifier has an ultra-quiet working mode, and you can use it while you sleep. It is maybe not so powerful to be used in huge rooms, but in medium, to large rooms, it will do a great job. UV-C light bulb and true HEPA filter have a LED light indicator which will tell you when you should replace them. This feature is essential because if you don’t replace your filters on time, you will not have fresh air in the room. Pre-Filter/Activated Carbon Captures large dust particles and pet hair, extending filter life. Activated carbon traps household odors and harmful VOC’s. Fights Germs UV-C Power Helps Kills Airborne Bacteria, Viruses & Mold Spores. 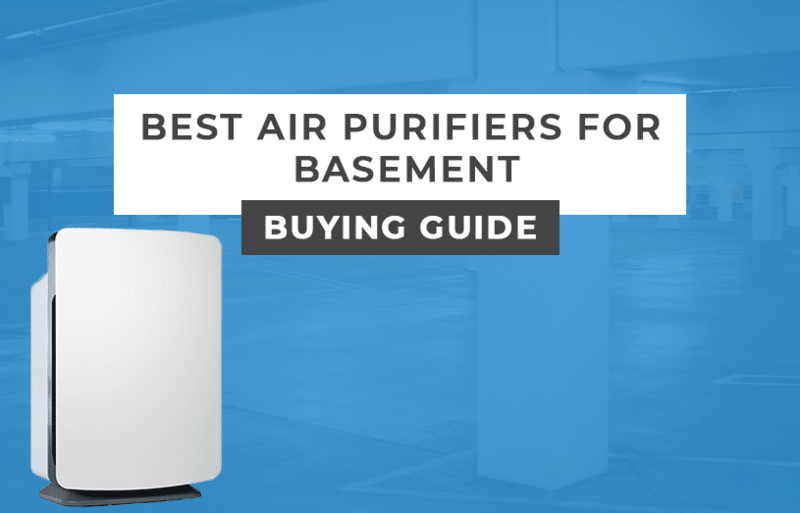 What is the Best Air Purifier for Basement? It is hard to make a decision to buy the best air purifier for the basement when that air purifier is extremely expensive. But like I already said some people have bad basements while others have so clean basements that you can actually live in them. For such folks I highly recommend to make such investment and buy Alen Breathesmart, you won’t regret it. After all, Alen Breathesmart is one of the best air purifiers on the world, and it is specifically built for covering large rooms such as large basements. If the powers of Alen Breathesmart is not in the limits of your budget, then you should consider buying Germguardian AC4852 for which I believe everyone has enough money to buy. Dehumidifiers are one of the best ways of reducing humidity in the rooms. Most of the time these devices are used in rooms with high humidity where mold could grow. A dehumidifier is used in the kitchen, bathroom, and basement. These are the rooms with the highest concentration of damp areas where bacteria and mold can grow. Dehumidifiers have no power of filtering the air, and because of that, they are mostly used with air purifiers. Air purifiers job is to remove airborne particles from the air and in this case eliminating mold spores that mold release to grow on other places. Dehumidifier job is to reduce humidity and by that remove mold by not allowing it to grow. Because of that features the combination of the dehumidifier and air purifier is an ideal solution for wet basements. You can read more about best air purifier and dehumidifier on our previous article written a few months ago. There is no favorite among these air purifiers, and everyone should choose on their own the best one that fits them and their budget. Whichever you choose it will do a good job. After all, it is better to have an air purifier and clean some air than no air purifier and accumulation of mold spores. For larger basement look for more stronger and bigger air purifiers that are capable of filtering air from larger rooms. Some of the air purifiers mentioned above have special filters which are working slightly better than ordinary filters in ordinary air purifiers. Some air purifiers even use some additional technology which may help in destroying mold from your basement. Remember to keep your basement clean, fresh and free from the mold you need to hold it at low humidity levels. Most of the air purifiers will not do this on their own, so you need to get a dehumidifier as well. An air purifier primary job is to destroy mold spores and by that prevent the mold from spreading over the whole basement. If you have a bad smell in your cellar, you should look for an air purifier that has the option to remove bad odor from the air. Most of the air purifiers with activated carbon prefilter will do that job just fine. It is on to you to choose which air purifier best fits your needs, but if you select any of the above mentioned, you will not go wrong.